Beijing’s Summer Palace sparkled on the clear June day. But the music I began to hear made it even more magical. Several female voices in angelic harmonies breezed through the pavilions and greenery. Was I at the gates of Heaven? I followed the sound and found this group of elderly women singing in a pavilion’s shade. They noticed the guitar I was carrying and invited me to join them. I was more than happy to, but I didn’t know any of the songs they were singing. They were all Western, but most were ballads from the 1920’s to the ’40’s. One’s called Beautiful Dreamer, which is much older–written by Stephen Foster (my friend Roger Harris pointed this out). It’s very pretty, but the last time I heard it was in a cartoon when I was a boy–Bugs Bunny or another Warner Brothers classic. 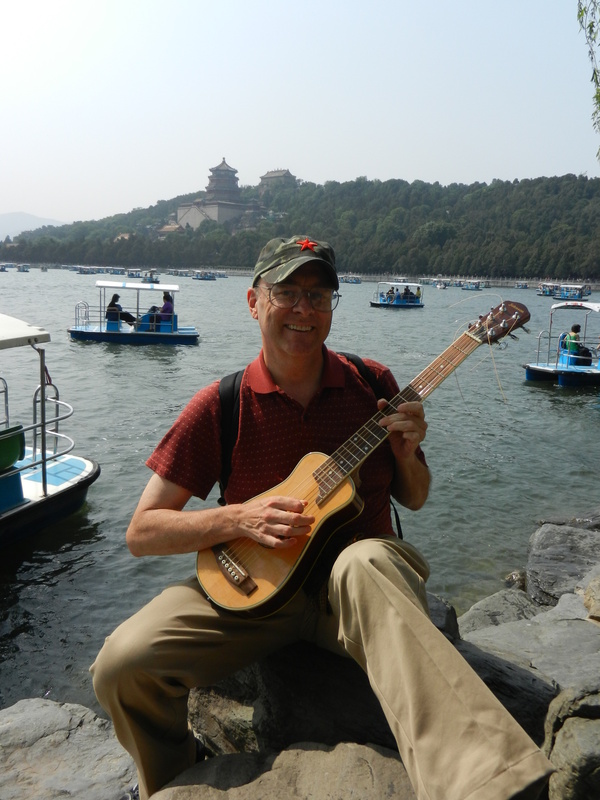 I’m used to improvising over songs that I don’t know, but the people I met in China prefer established songs that they’ve heard before–especially the elderly. Though most Chinese ears listen for scales and songs that their friends and family are already familiar with, young folks seemed to enjoy my own expressions. They’re curious about other cultures, and Chinese schools don’t teach much about them. But old people kept requesting songs they knew. 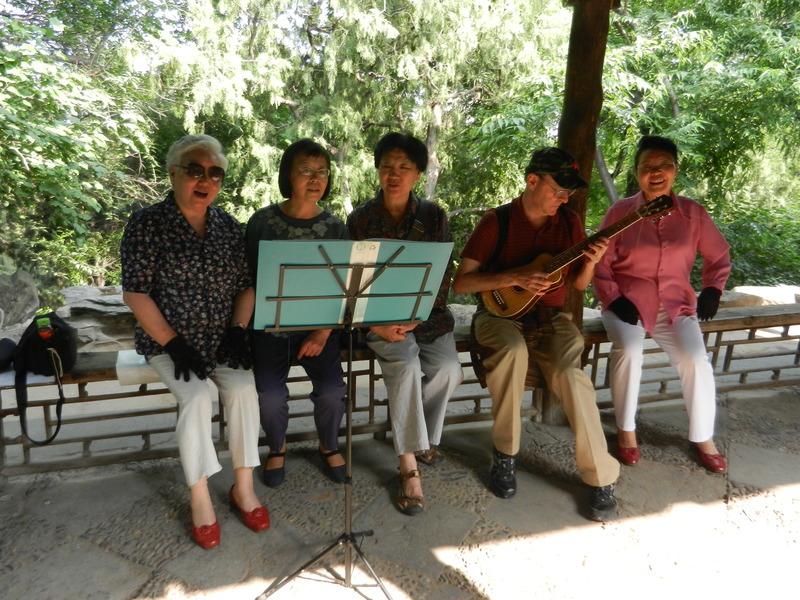 The women at the Summer Palace expected me to know the American songs that they sang, but I didn’t have the heart to say that they were from my parents’ generation, and before. So I improvised melodies over them and tried to make as few messes as possible. I must have fouled the air they had sweetened with plenty of errant notes–Beautiful Dreamer and Badass Rocker don’t mix. But they always made me feel welcome, and they kept complimenting my playing. One even got up and danced to a slow jazz song I had written. 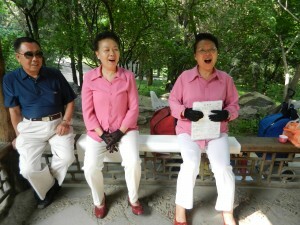 Many older people in China gather in public parks. They enjoy being in groups. Though their musical tastes are conservative, my friends from the Summer Palace enjoyed bringing a Westerner into their ensemble. It made their group larger, and it gave me a memory I’ll always treasure.